Balfour Whisper is an exciting combination of the greatest British Riding Pony lines including Solway North Wind, Bwlch Zephyr, Bwlch Valentino and Sarnau Miss Mink with the outstanding Welsh Sec B lines of his damsire, Thornwood Royalist. Whisper is 17.5% Arab and at least 30% Welsh so all his stock are eligible for part-bred Welsh registration. For more information please see below or contact his owner/breeder Natalie Gawley on 01341 423093, 07774 289162 or or Huw Gruffydd, Caereini Stud, Bala who is standing Whisper in 2019. Sire: Balfour Whisper is by the renowned Part-bred Arab stallion, Strinesdale Matador who was the sire of the 2003 HOYS Ridden Champion and 2005 HOYS In-hand Supreme Champion, Rotherwood Take A Peep, as well as the 2005 Ridden Show Hunter Pony Champion, Crafton Waltz of the Toreadors. The success of his progeny meant that Matador was the NPS Sire Rating Champion in 2006, 2007 and 2009. He was a sought-after pony sire, with many champion sons and daughters from Royal Show Champions to a Pony of the Year in Australia. In 2003, Matador had four individual ridden winners at the Royal Show. In 2017, one of Matador's last foals, the filly Cleapatra gained a prestigious SPSS GOLD Premium - a feat she repeated in 2018 when evaluated as a yearling. Matador's sire line goes back though Bwlch Zephyr to the famous Bwlch Valentino who has been credited with being the founder of the British Riding Pony and has a whole chapter dedicated to him in Tom Best's The History of the British Riding Pony. Dam: British Riding Pony, Balfour Squirrel’s Simone, was a successful Show Hunter Pony (10th at RIHS) and also went Eventing, Hunting, Jumping and to Pony Club before retiring to stud. As well as Balfour Whisper she is also the dam of NPS licensed stallions, Balfour Valentino & Balfour Tio Pepe; Balfour Toreador who sold to Sweden as a competition pony; SPSS Reserve Grading Champion Balfour Butterfly; and Balfour Ladybird, a successful racing pony. Her dam, Sarnau Squirrel won HOYS at her first and only attempt. Sarnau Squirrel’s full brother was Wingrove Minkino, a prolific sire, and full sister Wingrove Ermine who also won HOYS. Damsire: Thornwood Royalist, a Welsh Sec B, was very successful in hand and competed under saddle without people realising he was entire. He loved hacking out in company and jumping. 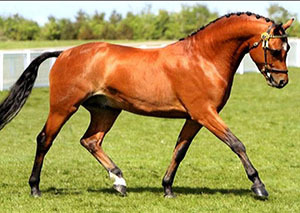 Balfour Whisper himself has excelled in the show ring with results including Champion Welsh part bred stallion at the 2011 Welsh International Show. At his 2015 SPSS grading, he gained the very high mark of 18/20 for his temperament and also scored well for his ridden work. He has won consistently over several years at top level. His last big win was the Royal Welsh 2017 when he was Champion and Gold Medal winner, P/B Welsh. He is a wonderful ride with an enormous, natural jump and enjoys his work. Whisper has great presence with exceptional temperament and willing attitude. He shows amazing ability, producing an uphill canter with natural balance. He is also great to handle from the ground and well mannered at shows. His progeny are doing very well in the show ring including Borderfields Whisper’s Echo who has been winning in-hand and was Reserve Champion at the North Western Association Youngstock Show in 2015 and Nordy Golden Whisper who was 2nd placed 2 year old colt at the same show as well as Supreme Welsh Part-bred and Reserve overall at the 2015 NCPA Yorkshire. Brightwells sold an offspring of Balfour Whisper at the 2015 Fayre Oaks Sales to Sweden as an excellent prospective dressage pony. Whisper is producing excellent foals from bigger mares including the Riding Horse Oathill Hero who was 4th at HOYS in 2018.